craftmetric: Folksy & Etsy Comparison Part 7: Everything Else! At last, the last post!! This one contains some stuff that didn't really fit in anywhere else, and a pep talk to encourage Folksy sellers to dip their toe in the Etsy waters! Although Etsy make this a bit easier for you, remember you can download sales from Paypal as well. Folksy doesn't have anywhere near such sophisticated tools on its website, but there are some useful numbers presented on your Dashboard; in particular, the number of orders received in the last 30 days, plus £ revenue in the last 30 days and over the whole history of your shop. 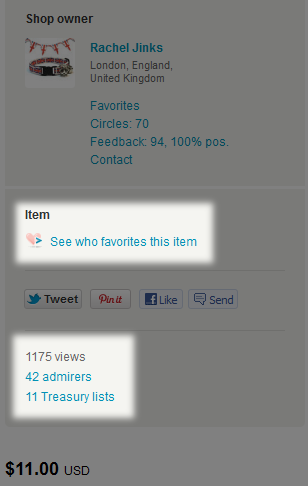 Unfortunately you can no longer find out in Folksy how many views your item has had; you must go to Google Analytics. You can see how many favourites each item has had: click on your username in Folksy to be taken to Your Dashboard, then click on "manage listings" and below each listing name is a heart symbol with the number of favourites next to it. Both sites have forums which are available to both buyers and sellers, although sellers outnumber buyers on there hugely! Etsy - The community is divided into Teams. There’s a team for everything! In particular there are many UK seller teams that can be a good source of advice and support. Some teams require you to be involved in active promotion of the other members – eg making treasuries including them, promoting them on your FB or Twitter or blog - and in return you obviously get a big boost too. These teams may be by invitation only and they may expect quite a lot of you. Some teams are there primarily for questions and support. Some teams do not allow you to promote your own stuff – or only allow it if you in turn are promoting others. I get by fine on Etsy without using Teams too much - I just don't have the time at the moment to join in the ones which require a real commitment - but I do like to pop in to some of the British support teams sometimes. There are a couple of forums left on Etsy (there used to be lots more) but technically these are also Teams that anyone can join. These include business advice, site help, etc. Folksy - Doesn’t have anything like Teams in an official sense, but sometimes I consider its forum to be a big Folksy Team! Due to Folksy's smaller size, I find the forums there more friendly and easier to navigate than Etsy's. Threads don't move as fast and it's easier to keep track of a conversation. There's a promotion board in the forum, but actually it seems you can promote your items to your hearts content in the other boards too. A common tactic is for someone to start a thread saying (for example) "Ooh I've just listed this hat with a big star on, anyone else got any star items?" and you’ll find lots of people will post their items there too. For Folksy-ers opening up on Etsy, do bear in mind that the kind of self-promotion allowed on Folksy is frowned upon in the Etsy forums and some Etsy teams. Note that on both Etsy and Folksy you MUST NOT call out on the forums or team threads. "Calling out" means referencing a particular seller or sale in an identifiable, negative way. I'll probably do a brief post on this some time as it can be tricky to understand. My opinion is, what have you got to lose? At worst, you lose a few 20c listing fees. At best you are opening your items up to a whole new audience. I have a theory that there is a group of people in the USA (mostly women, probably quite wealthy, not necessarily also Etsy sellers) who search on Etsy first when buying something. They are savvy - if they find something they want, they don't care if they have to wait a few weeks for it to arrive from the UK, paying $$ international postage, and they don't care if something vaguely similar is available more cheaply from a seller in their own country - they want THAT ONE. I love selling on Folksy, it works really well for me; but to put it bluntly, Folksy is not well known outside the UK. Even in the UK, probably more non-crafters have heard of Etsy than Folksy. If you want international sales, you've really got to try Etsy. The only people who may not benefit are people selling bulky, heavy, or fragile items, for whom international posting may be a chore; or people selling stuff that is really very generic - but I don't think there are many shops like that on Folksy. Jewellery sellers may struggle more to be seen in such a huge marketplaces, but I still think it's worth giving it a shot, perhaps putting more effort into joining Teams etc to get the boost you need. I know that an oft-quoted reason for not trying Etsy is the perceived difficulty of posting internationally. I'm going to talk about this in a couple of posts to try and show it really isn't that scary!! The Last Word: Don't neglect your Folksy shop, though! I know that sometimes Folksy sellers get disillusioned with what they see as the slow pace of change and improvements on the site. They may see Etsy as a holy grail of perfection. But if you see it this way, please do remember how much bigger Etsy is than Folksy (as I described in my first post). In the time I've been writing these posts (about a month) there have been several new features implemented by Etsy that I've had to add in. Etsy is constantly evolving and changing, responding to its customers (ie, us the shop owners mainly). This is purely because it has the investment and infrastructure to do this. Folksy does not - or at least, not in such a huge way. I've read every single bit! really interesting and thanks for taking the time to put it together! Interesting insights. I have had Etsy sites since 2008, and would definitely recommend giving it a go. Great series of posts, really informative! I'm now only on Etsy, but the comparison still makes for very interesting reading. Great stuff! Really enjoyed reading all of your posts! I have shops on both sides. I blow hot and cold with Folksy but I do sell so I keep it open. I like almost everything about Etsy and would recommend it to anyone wishing to sell. Great series of posts comparing the 2. I've just shared it on my facebook page http://www.facebook.com/MollyMooandJessicatoo as I know a lot of people who use just facebook to sell are looking at different avenues. I read all your information and learnt quite a bit even though I've been selling on both for over 3 years now! I love Etsy and am vowing to really learn how to use my shops properly. I get better sales on Folksy but if I'm honest the negativity on the forums there in the run up to and during the big changes in November last year really put me off. I still avoid the forums unless I'm really prepared!